ASLM is pleased to announce that CEO Dr. Tsehaynesh Messele was recently elected a member of the Core Group of the Global Laboratory Initiative (GLI) and presented at a GLI partners meeting. GLI is a working group of the Stop TB Partnership dedicated to expanding access to quality assured laboratory services in response to the challenges of diagnosing and monitoring tuberculosis. Dr. Messele represents ASLM on the GLI Core Group. Since 2008, GLI has developed essential tools and guidance frameworks to strengthen laboratory systems, particularly in TB-endemic countries. The GLI Core Group, whose membership is drawn from organisations involved in laboratory services at the national and international levels, serves as an independent advisory group that evaluates and facilitates GLI activities. Dr. Messele and six other new members were elected to serve as 2014-2015 Core Group members from a pool of over 50 applicants. From 30 April-2 May 2014, Dr. Messele participated in the 6th GLI partners meeting in Geneva, Switzerland, which convened key stakeholders to discuss GLI achievements, experiences, lessons learned and future plans. On Day 1 of the meeting, Dr. Messele gave a presentation on the Global Laboratory Initiative for the African Region (GLI-AFR), a GLI working group launched in 2013 in Addis Ababa, Ethiopia, with the goal of supporting African countries in the achievement of quality-assured and accessible TB laboratory services. Dr. Messele is currently the interim Chair of the GLI-AFR Core Group. Introduce and implement technologies and policies approved by the World Health Organization (WHO). 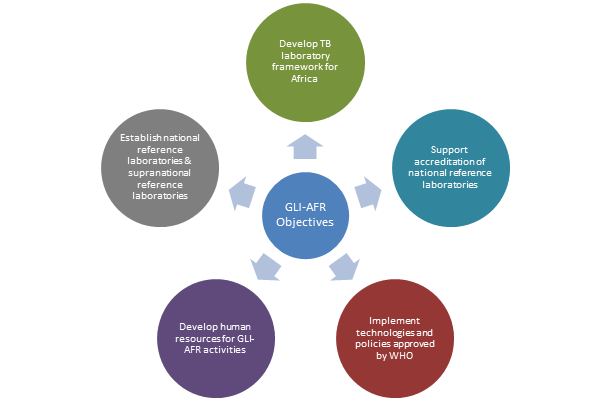 GLI-AFR will work towards its objectives through partner support activities, such as consolidating existing TB control efforts, pooling resources to scale up activities, promoting results-oriented collaboration, and engaging partners outside of the laboratory medicine sector.